Weekend sale for selected digital trades. Good prices if you don't have any of these. More TF digital comics for sale. 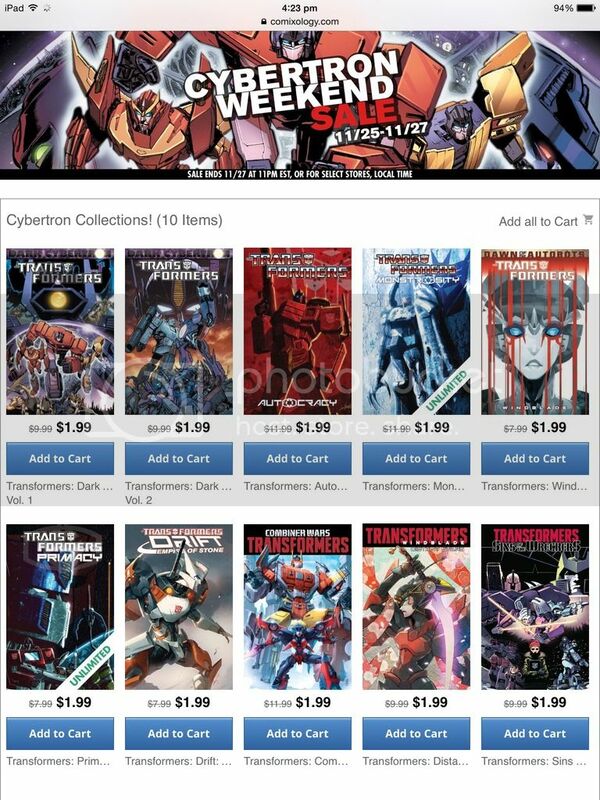 The site says 50% off select IDW comics for Hasbro properties. This should include The IDW Transformer titles, GI Joe or even MLP for those who are keen. I also said "should" as the code does not seem to apply to TF comics right now so most likely a glitch hopefully as the sales page takes you to all the TF comics as well. Use code IDW at checkout and valid till 24th Feb, 11am EST. These 50% of discount code offers generally don't apply to anything released in the last month or so, nor does it apply on already discounted items. Haven't used it yet, so can't talk to the specific TF glitch you note. Code seems to working now. The latest release nor the preorders (why preorder digital comics??) do not apply. Another sale for digital TF comics. Had a quick skim and looks to be pretty much all of them. Edit: sale ends 29th June. Took advantage to catch up on some of the non-LostLight ongoing series. Got a lot to read now. Another sale. This time it's across all IDW titles and 55% off with code IDW17. Sale on till 24th Jul. Valid for TF titles published online prior to 5th Jul. Also other stuff like TMNT etc. if you're after something different, might I reccomend Pinnochio Vampire Slayer. Yep..tell a lie and save us all! An IDW sale which includes quite a number of TF collections at up to 66% off. Hey, another sale! Up to 60% off this time. 55% off IDW titles until 4th Jan. Use code IDW at checkout.